My friend Jonathan went out and found these lovely autumnal colours in the local park. He took these photos and I wanted to share these with everyone because of what someone decided to do with the fallen leaves. Ephemerally beautiful, arranged in the manner of the art of Andy Goldsworthy, these are worthy natural artworks by an unknown creative. Spring is not the only time to find beauty in nature! In case you are interested, BBC has done a short film about why leaves change colour in autumn, which you can find here. Categories: Art, beauty, environment, houseplants, landscape, Memory, natural, outdoors, photography, seasonal, seasons, trees | Tags: autumn, beauty, creativity, environment, flowers, garden, gardening, nature, photography, world | Permalink. Categories: beauty, benefit, colours, environment, exercise, garden, Memory, outdoors, photography, poem, seasonal, seasons | Tags: colours, poem, street, trees | Permalink. This week has been of immense sadness- from the pain of the deaths of so many strangers that have touched our lives. From the nearly 500 people killed in the Gaza and Israel conflict to the nearly 300 Malaysian airlines passengers shot above rebel held Ukraine. The anger, pain and fear of families have been palpable, even in cyberspace. I have been struggling to make any sense of what is happening. I thought world wars were over a long time ago and that my children (and grandchildren) would only face climate change as a major threat to their existence, not wars. But now I see that I was so wrong. I see sadly that we cannot live with each other and we cannot live on our planet, fighting over small bits of land. These poppies come up in my garden every year. They give me hope. As a Buddhist, I can only hope like these poppies, the lives of the 700 and more people whose natural lives have been cut short, will arise again as messengers of peace and love. That finally sense will return. That our future is without weapons. That future will be love for each other. If you have been affected by the events of this week, do comment to let me know how you feel! 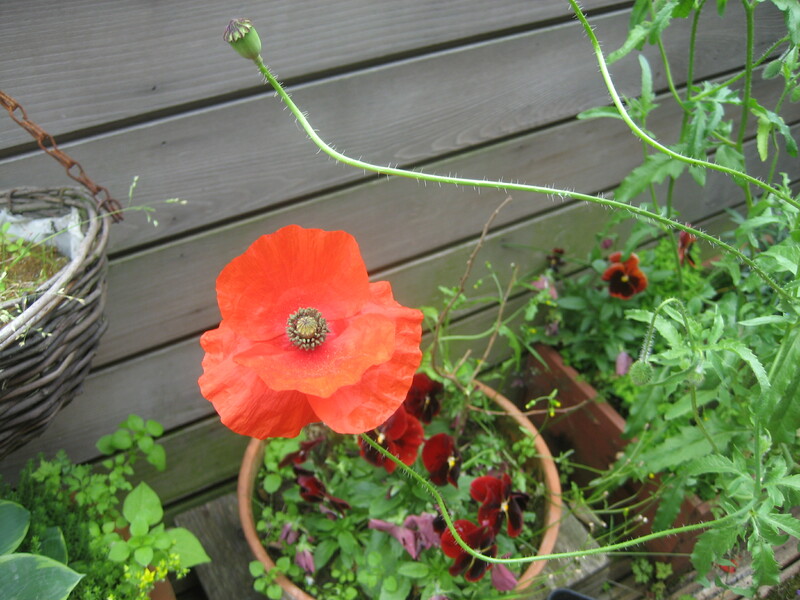 Categories: garden, Memory, outdoors | Tags: healing, pereniels, poppies, war | Permalink.